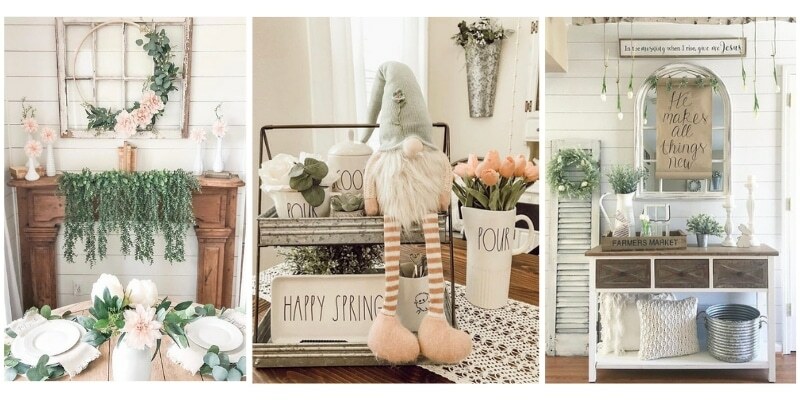 These spring decor ideas will welcome springtime into your farmhouse. You can spruce up your tiered tray, add new Rae Dunn pieces or bring in some greenery. Add some fresh colors to liven up the atmosphere. If the pollen has you locked up inside your home as it does us, then it’s time to bring spring indoors. 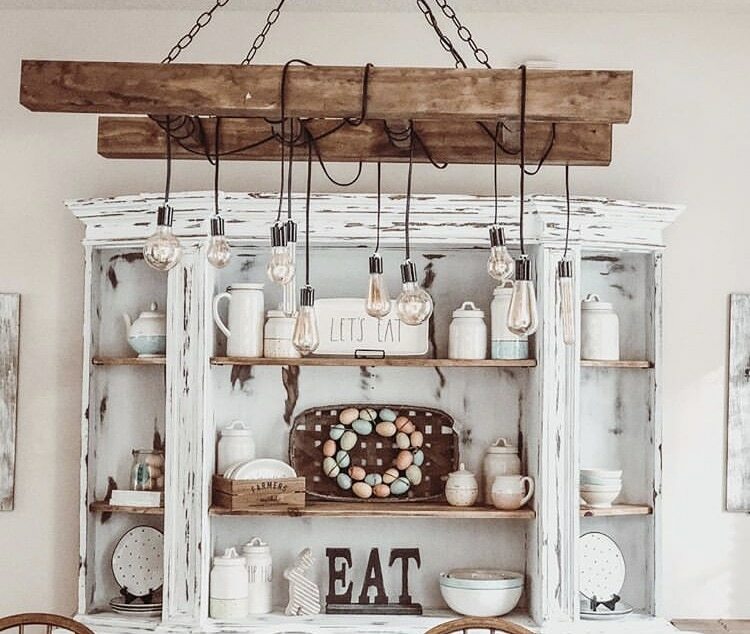 Spring decor ideas are precisely what we’ve rounded up. We have trendy blooming ideas that will inspire you. The promise that “He makes all things new” is comforting on cold winter days. 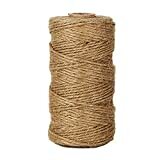 Spring has come, and it’s time for spring decor ideas. 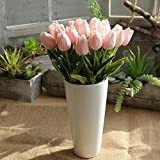 The tulips hanging from a rustic branch are charming! We created a Hanging Flower Meadow a while back, and in the post, we give steps on how to create your own. Hanging flower meadows add so much beauty in such an enchanting way. Asymmetrical wreaths are trending and perfect for bringing spring into your home. 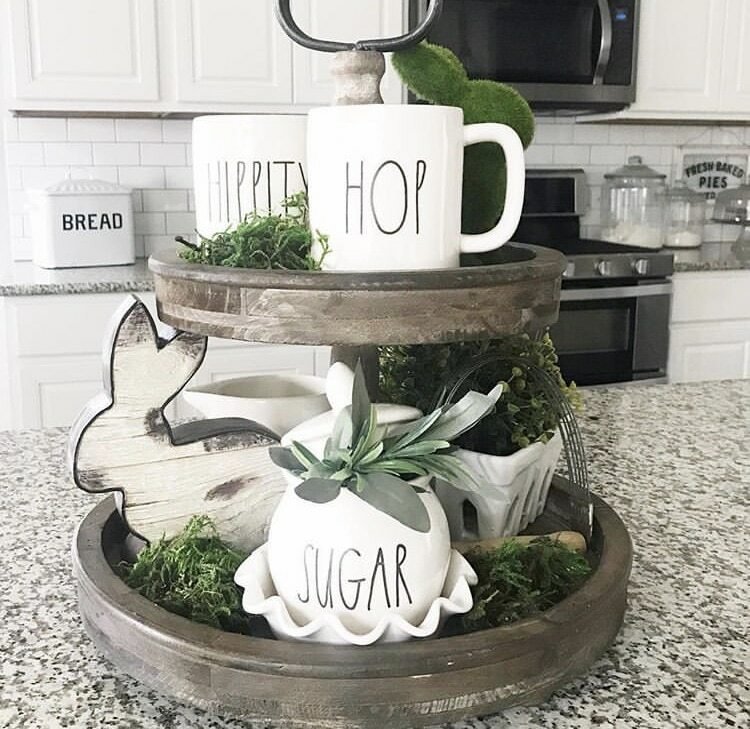 No spring farmhouse decor is complete without some eucalyptus. The spring mantel decor of milk bud vases holds new blooms for perfect pops of colors. Brittany’s home has the look of shabby chic. 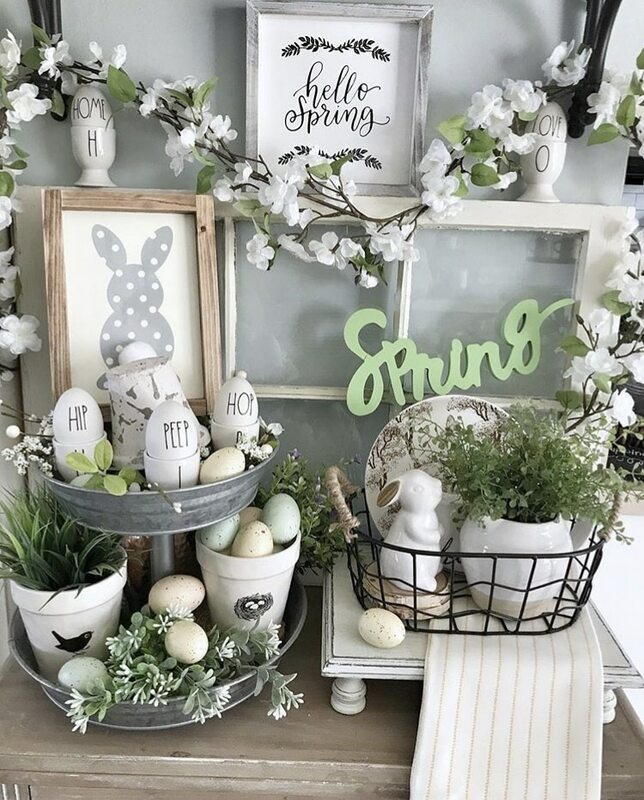 Adding Rae Dunn pieces that have sweet pastels on her hutch along with an Easter egg wreath is a precious dainty look. Dot’s Rae Dunn collection is beautifully accented with teal pieces. 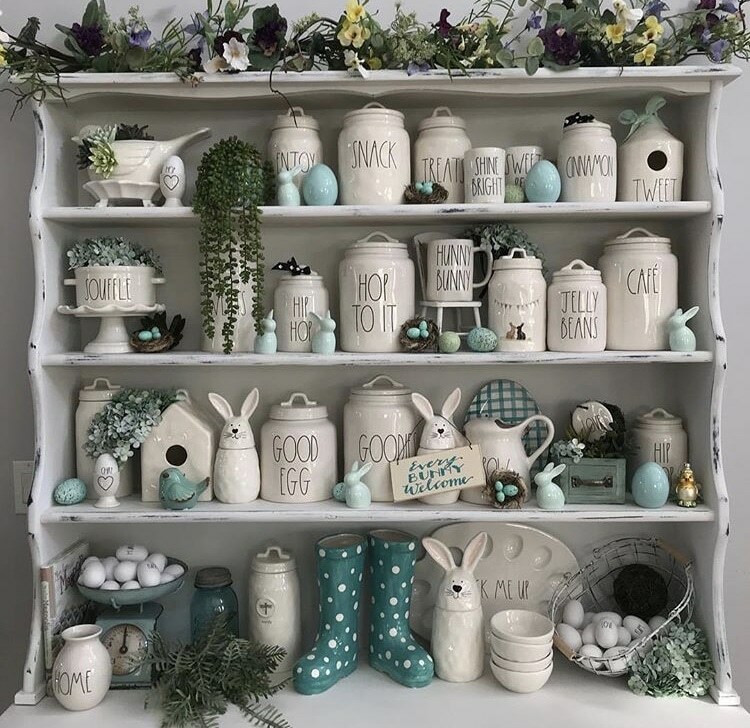 Ceramic rainboots, eggs galore and bunnies that are welcoming nestle right into this springtime vignette. This alluring entryway Jeanie Marie has designed with simply breathtaking. 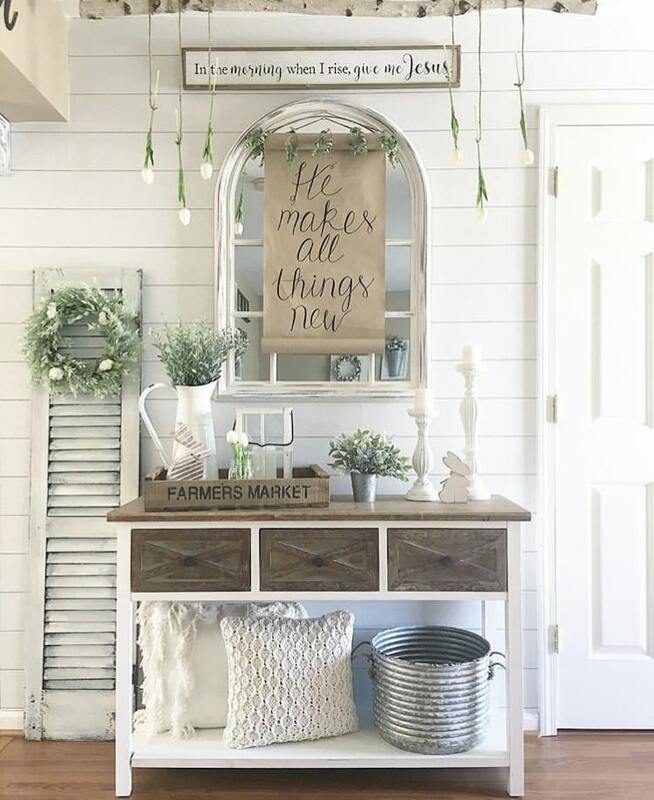 Neutral colors and different textures make this an inviting spring farmhouse decor dream. Taking a vintage window and making it the center of a vignette is perfect for a spring decor idea. 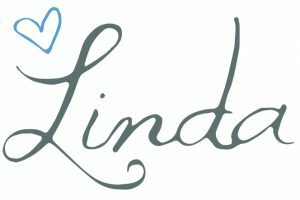 Now that you all have your tiered tray Kim gives some sweet ideas of what to put on it and how to style it. 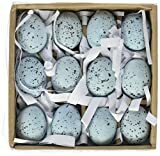 These eggs don’t only send across the message that Easter is coming, but that the sound of baby birds will soon be in the morning air. Rachel has some of our favorites on her tiered tray. Rae Dunn and a Gnome! 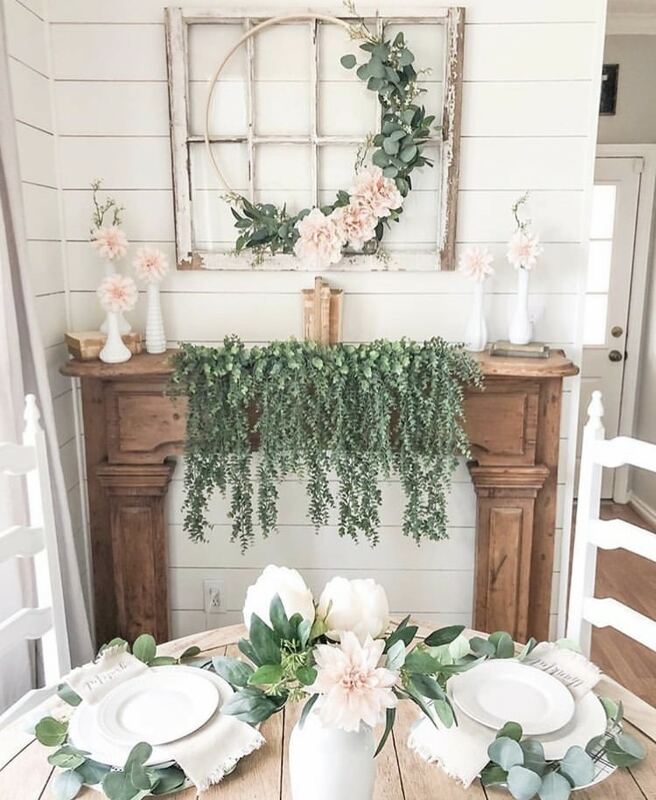 Adding flowers and greenery into your springtime decor is the best DIY anyone can accomplish. Yellow will cheer you up from winter blues. Lemons and bumblebee gnomes couldn’t put a bigger smile on our faces! 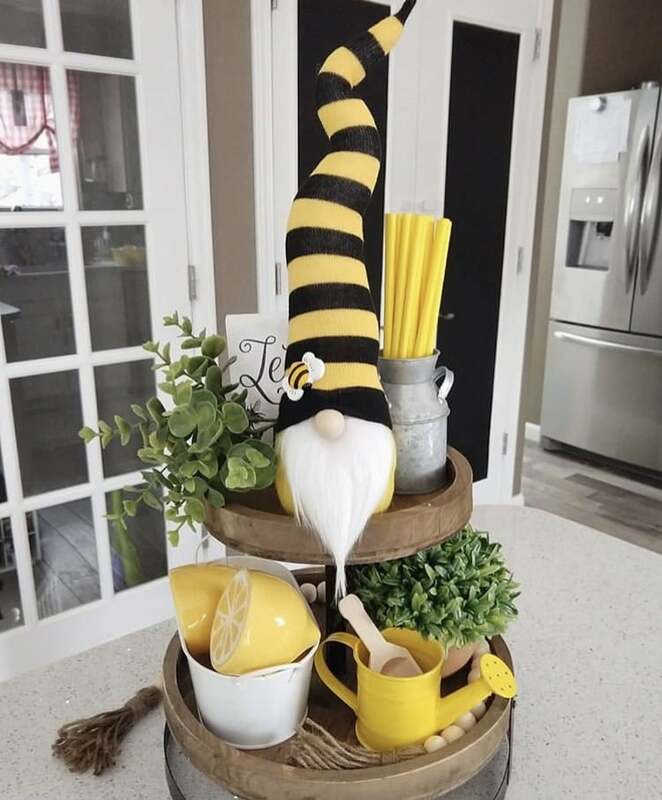 This tiered tray is just a happy piece to add to your kitchen. Erica has the trifecta on her tiered tray. 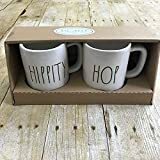 Rae Dunn pieces, wooden signs, and cute marshmallow mugs. 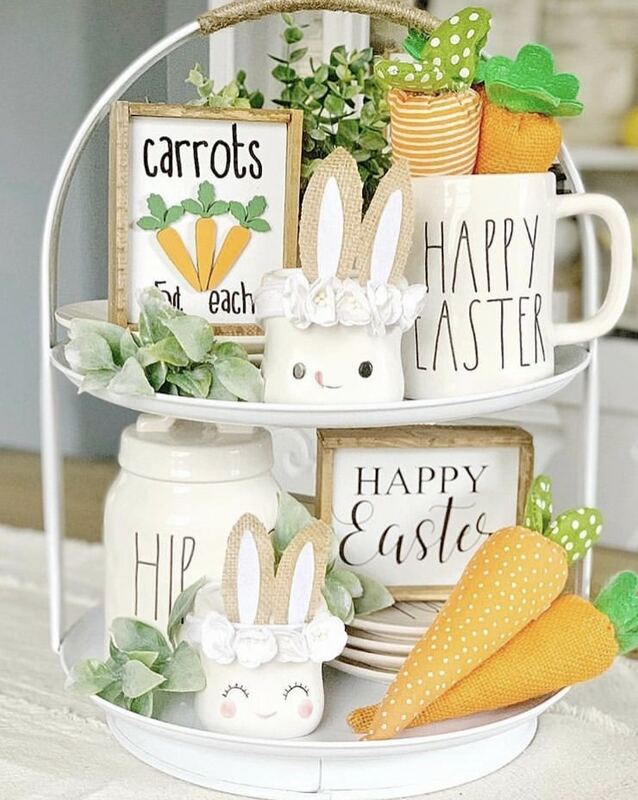 The accessories on the marshmallow mugs are perfect for Easter. 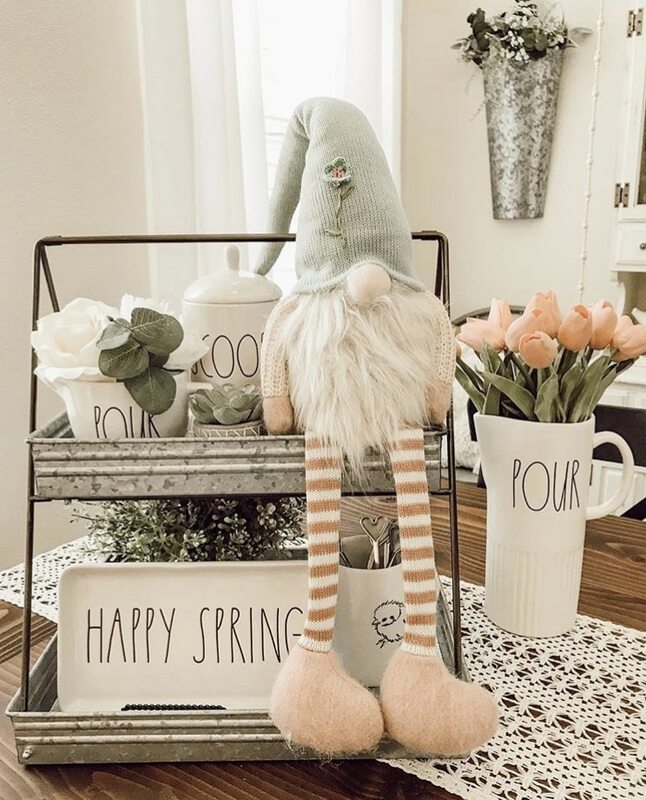 The 3-D carrot sign and stuffed carrots add the perfect spring decor color to this tray. Mossy greenery and white are great contrasting color pallets for your tiered tray. 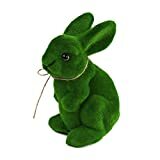 Bunnies and Rae Dunn say Hoppy Spring to all who lay eyes on it. 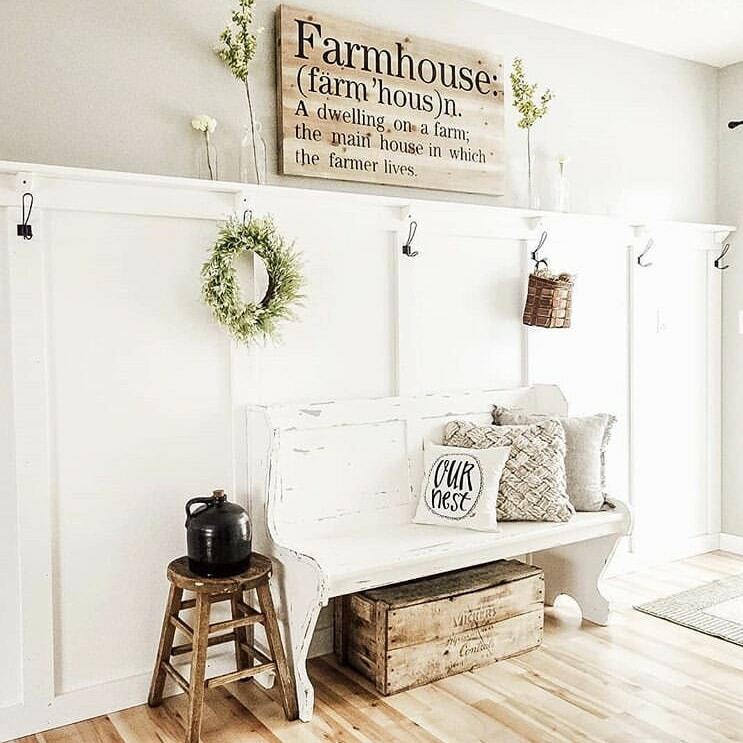 Take a Spring Farmhouse Decor tour around our home! Keeping things simple by showcasing pieces you already have at home is something we love.